These hanging decorations are simple to work and assemble. Stitched on 14-count perforated paper, each Sparkler is made from a number of separate pieces folded and stuck together to make three shapes in graduated sizes. (Use a strong glue stick or a liquid glue that will not soak through the paper.) Each kit contains all the perforated paper, thread, ribbon and beads needed, together with a needle, thread card, charts and full instructions. These three diamond shapes are worked on gold 14-count perforated paper and threaded with red ribbon and gold beads. 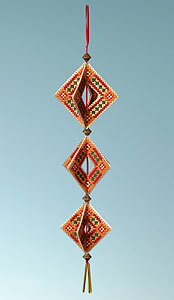 A group of gold bugle beads finishes the decoration, which is about 26cms long.